John Wick: Chapter 2 does what all good sequels should do: it deepens the storyworld and finds new ways of delivering the entertainment that made its predecessor a hit. John Wick: Chapter 2 is bigger than the first film in terms of budget and storytelling and it’s more inventive when it comes to action. The only drawback is that it’s not as primal. The first film was a streamlined surprise. No matter how good this sequel is, by virtue of being bigger and a sequel, it’s not as fresh as its predecessor. Instead, John Wick: Chapter 2 has to suffice with being another exceptional whirlwind of mayhem in an action cinema landscape that provides few films worth remembering. We know we’re in good hands right from the first shot of Chad Stahelski’s film, which demonstrates a clarity of vision and visual wit you don’t often see in American action films. We see footage of Buster Keaton driving a malfunctioning motorbike projected onto the side of a building (nodding to Keaton as the cinema’s greatest stuntman) and hear a motorcycle racing in the streets below. Soon enough, the camera tilts down and we catch a man crashing his motorbike into New York City streets. 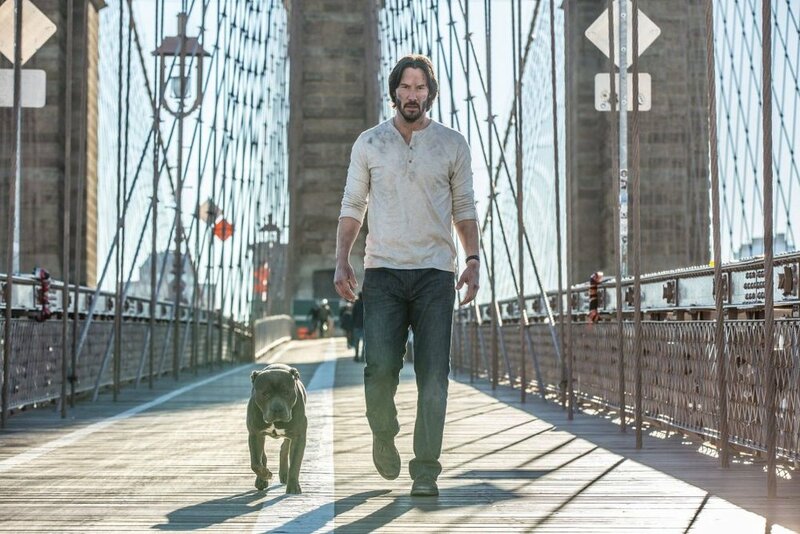 Then comes unstoppable assassin John Wick (Keanu Reeves) who chases the man down and beats his way through droves of Russian gangsters to reacquire his muscle car. Shortly thereafter, John retreats to the home where he lived with his recently-deceased wife. However, just as he puts his guns and gold coins back into the ground, the Italian crime lord, Santino D’Antonio (Riccardo Scamarcio), arrives on his doorstep and demands John repay the favour that made it possible for him to retire in the first place. John initially refuses, but after Santino firebombs his house, he realizes that no is not an option. He has to fulfill one last contract before Santino will allow him to return to retirement. John Wick’s world operates on rules and those rules cannot be broken. John gave Santino a marker signed in his own blood. He cannot refuse how Santino decides to cash that marker in. It’s these rules that make the world so fascinating compared to the vast majority of action franchises that have an interesting central character but a world lacking intrigue and atmosphere. Thankfully, if the first film only flashed the cover of the complex rulebook of the Continental Hotel and its assassin denizens, John Wick: Chapter 2 shows whole pages. This is best on display when John Wick heads to Rome and stays in its version of the Continental, complete with Franco Nero as the manager who looks like an Italian version of Johnny Hallyday. There, he accesses the full assortment of services afforded assassins, including an expert tailor, an architect able to produce ancient city plans, and most amusingly, a gun sommelier played by Peter Serafinowicz. The filmmakers display their relish for codewords and rituals in these moments. For instance, John’s visit to the sommelier is conducted entirely through euphemism. After acquiring new handguns, the sommelier asks him what he wants for after dinner. “Something robust,” John replies. The sommelier hands him a shotgun as if it’s a bold merlot. It’s playful and clever, teetering right on the edge of parody without crossing over. It exists right where the John Wick franchise thrives. It’s wonderful that an action film fills its downtime with such colourful detail, especially since the action is so good, it could excuse all the rest. Like its predecessor, John Wick: Chapter 2 boasts remarkable action. Director Chad Stahelski (a former stuntman and Reeves’ stunt double on The Matrix Trilogy) orchestrates the carnage like he would a ballet. Every movement is graceful and motivated. His camera mostly stays behind or in front of Reeves, positioning him centre of the frame and carefully detailing his every punch or gunshot. The camerawork is clear, but the action is ferocious. This combo, along with Stahelski holding his frames and using cuts sparingly, makes every punch and gunshot land harder. There are also some wonderful images that expand this sequel’s visual style. A mid-film shootout in the catacombs of Rome is an opportunity for cinematographer Dan Laustsen to flood ancient walkways and caverns with diffuse, blue and red light, transforming the space into an extension of an earlier outdoor club. He even places his lights in the frame, disguising them as part of the environment. Later in the film, during the action climax, John Wick enters a hall of mirrors at a New York museum and the frame depicts a dozen Wicks hunting for his prey, visualizing the internal struggle that drives his psyche. One shot appears to show John Wick both entering and exiting centre frame, while also portraying his POV. It’s the type of shot I’m still marveling over a week later. Of course, John Wick: Chapter 2 would not be nearly as good if Reeves didn’t continue to shine in the role. John Wick is Keanu Reeves’ best role. The star has only grown more charismatic and imposing with age. Reeves has limited range, but within that range, he’s incapable of guile, which makes him uniquely suited to give a sympathetic, believable performance in a film that asks him to accomplish impossible action stunts. No matter how preposterous the action moment, Reeves’ truthful nature grounds it. In fact, if Reeves were not at the centre of this sequel, the film would not work. No matter how gorgeous the action or atmospheric the storyworld of John Wick: Chapter 2, the act of going bigger and broader requires a sturdy foundation. Reeves is that foundation, grounding the story and linking it to recognizable humanity. Without him, the explosion of story and action would only be pyrotechnics, something akin to The Raid 2, a dazzling action film with a blank-slate hero who cannot sustain the film’s operatic drama. Luckily, the madness of John Wick: Chapter 2 is as calibrated as its central performer. It’s a work of sublime carnage in perfect balance. Directed by Chad Stahelski; written by Derek Kolstad; starring Keanu Reeves, Common, Laurence Fishburne, Riccardo Scamarcio, Ruby Rose, John Leguizamo, Claudia Gerini, Lance Reddick, Peter Stormare, Franco Nero, Peter Serafinowicz, and Ian McShane.